In 2005, three major storms collided and it completely changed my life and my perspective on the world. When my heart and mind changed, I made radical changes to my courier business. The reality for all of us is that the world is fine until a problem affects you directly. Then you make changes. This is my story of how I became involved in Atlanta’s environmental world. Strike One-In August of 2005, Hurricane Katrina hit the northern gulf coast killing almost 2000 people, and destroying 81 billion dollars in homes and businesses. As the people of Louisiana, Alabama and Mississippi fled inland to Atlanta they were greeted by gas gougers who had bumped gas prices to over $3.50 per gallon . It disturbed me that as churches were volunteering and making resources available to help families that had lost everything, some unscrupulous businesses were trying to profit in their time of crises. Strike Two- When the price of gas increased over a dollar a gallon in a short period of time, it created panic in Atlanta. Everybody started buying gas in case we had a shortage. I was leaving to go out of town on a Friday and three gas stations were out of fuel and at the fourth one, I had to wait 15 minutes in a line of cars with highly stressed out people to buy high priced fuel. At that very moment, sitting in that hostile line, I told myself I would do what I could to get my company away from dependence on fuel. The following week, for my drive home from work, I put down the top on my car on Highway 400. When the traffic went bumper to bumper and stop and go, the fumes from all the cars and trucks were intoxicating. The smell of diesel and idling cars is a terrible smell. It’s hard to enjoy a car, the fresh air and freedom when you’re choking on dirty air. Strike Three- Not long after my experiences with high priced fuel, gas shortages, and dirty air my wife and I started to seek out other areas for a better quality of life for our family. We soon changed our diet to get away from the preservatives and dairy products. We became a lot more conscious of clean water and clean air. In the process, I decided I was going to change my company. We changed to Green Express with an environmental message reflecting our core belief in doing the right thing. 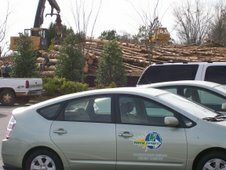 We started buying hybrid Toyota Prius cars; we moved away from paper and started e-billing, and started taking office waste to recycle centers. Our Progess: So far this year, Green Express has reduced our paper consumption in the office by 75%. Through our hybrid cars, we have reduced consumption of gasoline by 650 gallons saving $1700 in fuel costs. By switching from tradional courier vehicle to hybrids, we have reduced our greenhouse gas emissions by an estimated 30 tons. So we have reduced 30 tons of emissions of carbon dioxide, nitrous oxide and methane from Atlanta’s air. Atlanta is excited about going green and we have picked up over 60 customers in a couple of months. Green Express is growing and plans on bringing on more hybrids by the end of the year as more new customers come on board. An Atlanta courier is trying an alternate route to business success. Green Express is in the process of converting to hybrid electric cars as part of an overall transformation to become more environmentally friendly. The company bought four of the cars in January and will purchase two more this summer, eventually replacing all 10 cars in its fleet. The new Toyota Prius vehicles are getting about 50 miles per gallon compared to their previous vehicles, which got 20 to 25 miles per gallon, said Jay Holgate, managing partner of Green Express. Its drivers travel about 2,500 miles per day, so gas mileage is extremely important. The company's bottom line is very vulnerable to fuel price fluctuations and the hybrid electric cars have proven to be a sound investment, Holgate said. "We wanted to do something different to get us away from being so dependent on oil," said Holgate. The changes at Green Express are part of a growing trend of companies recognizing the potential benefits of becoming more environmentally sustainable. "They want to reduce emissions and keep their consumption of fuel down so they can save money, reduce the risk of regulation and be responsive to the growing consumer demand for more environmentally friendly and socially responsible products and services," said Susan Graff, a principal at the consulting firm ERS Inc. The U.S. market for environmentally friendly products and services -- ranging from industrial products to kitchen appliances -- is about $158 billion, according to an organization called Lifestyles of Health and Sustainability. Graff, a former executive with the Environmental Protection Agency, has been helping companies like The Coca-Cola Co. (NYSE: KO) and Unilever Plc with environmental strategies for more than 10 years. She says environmental issues are gaining new clout in the corporate world as large companies like Wal-Mart Stores Inc. (NYSE: WMT) and Interface Inc. put pressure on their suppliers to become more environmentally sustainable. "A company like Green Express will be well-positioned to take advantage of these large companies that have gone to giving preferential treatment to suppliers who have reduced their environmental footprint," Graff said. Green Express changed its name from Georgia Couriers in January as part of its overall transformation, which included installing fluorescent light bulbs, using recycled products and making many other changes. Some smaller firms are also showing their support for greener companies. Since Green Express rolled out its hybrid vehicles, the company has added 38 new clients who turned to the courier because of its green approach to doing business. Among them is architecture firm Tunnell-Spangler-Walsh & Associates. "We liked the fact that they have an understanding of how their business impacts the environment and they have that as an ideological underpinning for their business model," said Christopher Leerssen, an associate architect with the Midtown-based Leerssen says he sees more companies gradually going green. "People are naturally reluctant to change until they see other businesses proving that green [initiatives] are financially feasible and beneficial," Leerssen said. Graff says companies should start by looking at their carbon footprint, which is a measure of the impact they have on the environment in terms of the amount of greenhouse gases produced. At the same time, they should also look at how much money they can save by reducing their carbon footprint. "You have to have a business case," Graff said. Green Express executives say that's exactly what they have discovered. The cars will pay for themselves in about five months and will continue to save the company significantly on fuel costs, Holgate said. "We are absolutely better off in the long run financially," Holgate said. "We use a ton of fuel, but as prices go up you can't just keep passing the price increase on to customers," he said. "It's a huge expense for us." Finally, a Green Option for a Much Needed Service. Atlanta customers seem to be enjoying having a green option when it comes to courier services. Green Express is the only courier service in Atlanta that delivers packages in hybrid cars. Green Ex announced their conversion to hybrid cars in May and new, supportive customers have been placing orders ever since. Improving the Quality of Life for All Atlantans. When we started Green Express Couriers, our sole objective was to improve the quality of life in Atlanta through our services. The biggest improvement opportunity as a company was to change from traditional cars to hybrid vehicles. Our traditional cars were getting about 22 mpg and our hybrids are getting 50 mpg. So we started buying Toyota Prius hybrid cars. Today, we're using less fuel which decreases our country's demand for oil. Our prices Haven't Increased. If your company is trying to decide if you should change courier companies just think about this way. All things being equal, we hope that you will choose the green choice. For every company going green, we are able to put more green cars on the road and eliminate another gas guzzler. Hybrids are Better for the Environment. Our hybrid cars are driving the streets of Atlanta delivering packages, helping businesses meet deadlines with same day delivery and overnight services. We love the fact that the hybrid system uses very little fuel in speeds under 30 mph. In bumper to bumper traffic, the hybrids basically turn off, emitting zero emissions into the air. It's better for the environment and it's just the right thing to do. 770-394-3131 or partner today at Green Delivers! Wow. What an amazing three weeks. Green Express sent out one press release and our entire world changed. The Power of the Web. The number of visits to our website increased 10 fold. Green Express was published in Forbes, MSNBC, Auto Channel, Automotive News, the Atlanta Business Chronicle and locally by Appen Newspapers, Inc. and at least another 30 internet aggregators. We were also picked up by CBS46 news, and WSB-TV did a feature story and named me the Green Champion of the week. It has been a busy couple of weeks. For me, sending out our release was a huge relief. Our goal was to be America’s First Courier Company to Switch to Hybrids. We came up with the idea of a hybrid car courier company two years ago, and have been working it and hoping another courier company didn’t beat us to the punch ever since. We have re-organized, converted our customers and changed the way we do our day to day business, under the radar. And now, with the exposure, we are above the radar and promoting our hybrid car delivery service to corporate Atlanta with success. In essence, we built a green company by scrapping everything we knew, and starting over. We made the conversion and investment to be a green company and our customer’s rates stayed the same. Operationally, Brent Hilburn and Carter Hooks made sure that every change we put into effect, did not increase the cost for the customer or sacrifice our on-time delivery percentage of 98%. They would not let our customer’s service be compromised or our customer’s prices increase because our company had a new commitment to the environment. Through hard work, they made it a win-win for everybody. Green Express also couldn’t have done this without the brilliance of my marketing team of Lisa Frank and Diane Bates. They put together a great story of Green Express, released it when gas prices were at an all time high, and pitched our story to interested editors. We are grateful for their passion to see a better Atlanta, a corporate community committed to being environmentally responsible and their expertise in crafting a strong message. We couldn’t have done it without them. With all that being said, our journey is not over. It has just begun. Green Express will move responsible Atlanta companies into our customer list, one client at a time. We will impact Atlanta, its leaders and hopefully its families. I hope you will join us and bring your network with you. Looking for Courier Jobs in Atlanta---GO GREEN! Have you ever considered being a courier driver? Are you looking for independence in your job? What about normal working hours? Is interaction with professionals important? What if you received a consistent paycheck, weekly? Green Express is Atlanta's most celebrated courier company with recent articles in Forbes, Atlanta Business Chronicle and television appearances on WSB-TV and CBS46. With all the positive publicity has come a lot of new customers. Green Express is hiring courier drivers for our Atlanta service area. We want drivers that know Atlanta roads, delivering packages with a smile. Independence. How Sweet it is. Our courier drivers are hired as independent contractors so there is no driving into the office in the morning, or driving to the office to pick up a paycheck. Our couriers start working from their home and usually never see the Green Express office the whole day. Our couriers receive their jobs on a phone and communicate to the office on a 2 way radio. If a driver gets lost, we guide them to their destination through our GPS mapping system. The Mailman Does Not Deliver on Sunday. We work normal business hours. Our deliveries are done basically Monday thru Friday during the business hours of 8:30-5:00. We are not looking for part time drivers or drivers that want to work primarily outside these hours. Interaction with Professionals. We want only professional people working with our company. Our drivers are primarily picking up and delivering packages to professional businesses and government offices. Because our courier drivers are going in and out of professional businesses every day, our customers expect to be dealt with in a professional manner. For security reasons, all drivers are required to wear an identification badge (provided by Green Express) while making deliveries. Must Have a Reliable Vehicle. Our couriers are driving approximately 100-200 miles per day. Some of our couriers are in hybrid cars but starting out you can have a traditional car. Drivers are responsible for providing their own car, gas, insurance and maintenance. Safe Drivers Only. Do not apply if you have violations on your driving record. You must provide a clean Motor Vehicle Report to be considered. Our Drivers are Paid Weekly. Our couriers are paid a commission on the total dollar volume of runs they complete. Each driver receives a weekly statement that includes the runs and amount paid. Our drivers average between $550-$1000 per week. Green Express does not deduct taxes from weekly checks because our drivers are independent contractors and responsible for filing their taxes. Please do not call office.